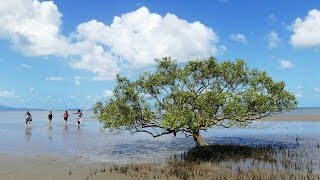 2 hour coastal and mangrove walk with Kuku Yalanji Cultural Habitat Tours. Travel to Cooya Beach north of Port Douglas to meet with the Kubirri Warra brothers, who follow the traditions of their ancestors. This special place is a traditional fishing ground of the Kuku Yalanji. The brothers teach guests how to throw a spear and demonstrate how to search and hunt for fish, mud crabs and mussels. Learn about bush tucker and medicines before enjoying home made damper on the balcony of the family’s home, where you will taste your catch of the day. Combine the Great Barrier Reef with the Daintree Rainforest and visit two breathtaking UNESCO World Heritage Sites with one package! 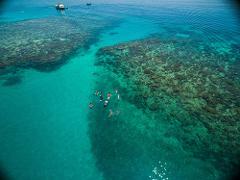 Choose one of the below Great Barrier Reef tours from Cairns or Port Douglas in combination with the Daintree Dreaming Day Tour for the ultimate 2-day Adventure North Australia experience. Combine any of these with the Daintree Dreaming Day Tour! Departs Monday, Tuesday, Thursday and Fridays. 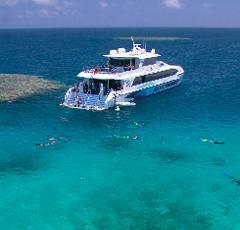 Reef Tours operate Daily except Christmas Day. 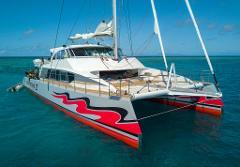 Set sail aboard the 32m luxury sailing catamaran, Ocean Spirit. 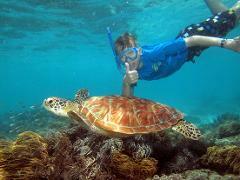 Enjoy a wide range of activities to experience Michaelmas Cay’s picturesque reef environment. 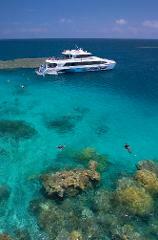 Snorkel, cruise in the semi-sumersible or just relax and enjoy a leisurely day on the Great Barrier Reef. Travel to Cooya Beach north of Port Douglas to meet with the Kubirri Warra brothers, who follow the traditions of their ancestors. This special place is a traditional fishing ground of the Kuku Yalanji. This unique coastal environment has three diverse ecosystems – beach, mangroves and coastal reef – that are connected to each other by the every changing mud-flats and tidal lagoons. The brothers teach their guests how to throw a spear and demonstrate how to search and hunt for fish, mud crabs and mussels. Learn about bush tucker and medicines before enjoying home made damper on the balcony of the family home while you taste your catch of the day. You are welcomed with a traditional ‘smoking’ ceremony. This ceremony is conducted by Aboriginal people with specialised cultural knowledge to welcome people to their land. It is a ceremony of spiritual cleansing, to ward off evil spirits and to ensure that while you are on the traditional land of Kuku Yalanji people, you are accepted and honoured. The specially designed menu featuring predominantly locally sourced produce infused with Indigenous bush ingredients. Nestled in the World Heritage Listed Daintree Rainforest, Mossman Gorge contains the oldest, continuously surviving rainforest on earth. Experience this pristine natural wonder with a guided rainfrest walk. Adventure North’s qualified guide will unlock the secrets of this fascinating ecosystem. You will see strange primitive plants and there is even time for a swim in this magical rainforest environment, so don’t forget your swimmers! Optional Extra – An opportunity for visitors to Mossman Gorge are the Ngadiku Dreamtime Walks, conducted by the local Indigenous guides. Ngadiku (Nar-di-gul) means stories and legends from a long time ago in local Kuku Yalanji language. You are welcomed with a traditional ‘smoking’ ceremony that cleanses and wards off bad spirits. The walk then meanders through stunning rainforest and takes in traditional huts or humpies. Your experienced interpretive Indigenous guide will demonstrate traditional plant use, identify bush food sources and provide an enchanting narrative of the rainforest and their special relationship with this unique tropical environment. Your guide will also demonstrate traditions like making bush soaps and ochre painting. At the end of the tour, enjoy traditional bush tea and damper. I came to Australia to visit the Great Barrier Reef, but I was even more amazed to discover the beautiful paradise that is the Daintree Rainforest. I would have never experienced this incredible world wonder had it not been for the 2-day Reef & Rainforest Aboriginal Cultural Tour with Adventure North Australia. It’s the perfect combination for exploring Cairns. 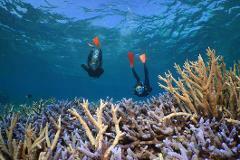 Come for the reef, stay for the rainforest! This was my first visit to far north Qld. 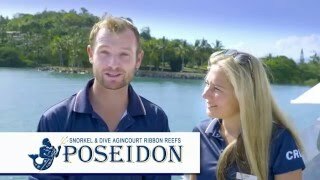 I stayed in Cairns and took this trip for nature and historical reasons. The whole trip exceeded my expectations in every department. Cathy and Kate were our tour guides and were very friendly and extremely knowledgeable, putting everyone at ease and going a long way to making the day a wonderful experience. Everything was well organised, food was great and photo opportunities all you could ask for. A long day, but returned tired but happy. All in all, I couldn't have wished for more. We received more value than the cost of the trip and I absolutely recommend to anyone that they should do this tour. Well done Cathy and Kate and well done Adventure North.